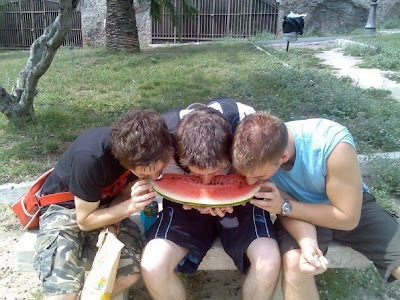 ok, so this picture was actually taken a few months ago when i was in rome with my friends this summer, but james only just got round to uploading his pictures so i thought i'd post it in this blog now..
i'd totally forgotten that this had even been taken, so it was kind of cool to see the watermelon eating event back again! sooo... what do people write about in these things then... hmmmm. well.. i had a good christmas i suppose, looking forward to new years as well. i think i'll post a "reflective" blog in a couple of days where i look back at 2007. yesh. the past couple of weeks have been kinda cool on youtube. "my secret" video got featured on the UK homepage and got about 100,000 views, and then a few days later I took part in the vlogbrothers secret project for awesome... which was indeed AWESOME! that video got over 70,000 views, and like 3,000 comments, which is pretty insane... the nerdfighters are amazing! 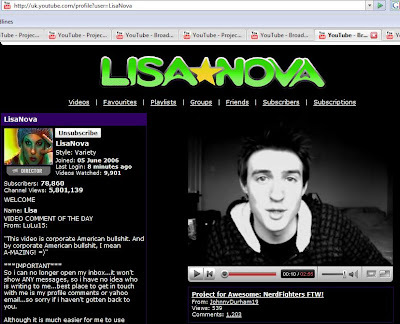 it turns out LisaNova is a nerdfighter too... who knew?! i love when people like LisaNova, HappySlip and WhatTheBuck subscribe to me... i dont know why... it's just nice to know that these people who make great videos themselves, and have thousands of fans, actually like my videos too... so umm... yeah. i think that's about all i can think to write about for now. all the cool kids have blogs these days.. i totally decided to jump on the blogwagon too.